I'm after a Campagnolo front mech. with cable guide, from 1960s, ideally a Valentino if possible but not the matchbox type. Yes, that's the sort of thing! 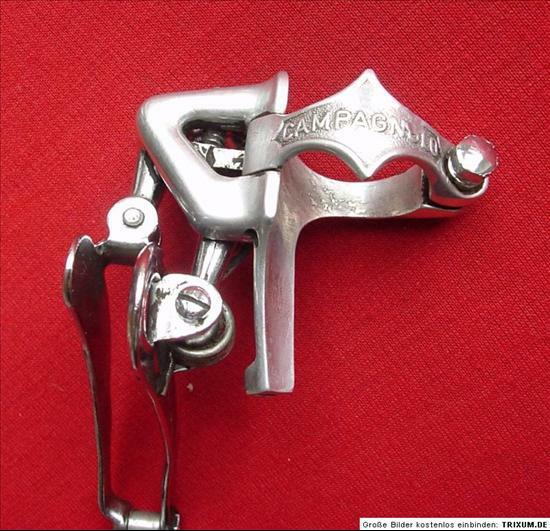 Hi are you still after a Campagnolo front mech. with cable guide, from 1960s? I'm still looking, so would appreciate a photo and price. Still looking in case anybody has one. I've got one - but it's MINE, ALL MINE, I tell you!! I do need a 'plain' cage for it though (ie, without the silly 'safety' lip on the front). I thought I had one in my stash but I'm damned if I can find it! It's the one I've had from new so must be approx. 50 years old. The adjusting screws were snapped off flush with the body and corroded in. I thought it was a 'gonner' but a friend with an extensive workshop of small machine tools got them out with a milling machine. A good polish and some new screws and springs and it's ready to roll again. It'll work better with a cage though. As an after thought, comparing it with several later versions, it's amazing how different the castings are when put side by side. Nominally we think that they are all the 'same' - but they ain't! Thanks Ned, If you ever get tired of it let me know. I had the same trouble with seized screws in another old Campag. mech. I spent ages carefully drilling them out and just as I was nearly done, I somehow managed to snap the cage. I can't tell you how frustrating that was!